Former Workers’ Party president Seán Garland may be prosecuted in Ireland, despite not being extradited to the United States. Sean Garland, 76, is wanted by the United States in connection with the alleged distribution of counterfeit $100 'superbills'. 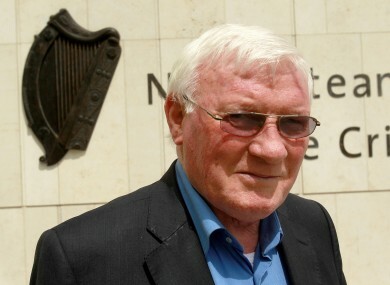 THE HIGH COURT has asked the Director of Public Prosecutions to consider whether the former president of the Workers’ Party, Sean Garland, may be prosecuted in Ireland for his role in the alleged distribution of counterfeit US dollars. The court ruled two weeks ago that Garland, 76, could not be extradited over charges that he assisted in the distribution of counterfeit $100 ‘Superbills’, printed in North Korea. Publishing its ruling this morning, however, Justice John Edwards said he was referring the case to the DPP, in order to ascertain whether Garland should face charges in Ireland over the alleged counterfeiting. This was because the offences for which Garland was wanted by the United States had technically been committed in this jurisdiction. The court ruled, however, that Section 15 of the Extradition Act of 1965 – which says extradition cannot be granted when the alleged offence had taken place in this State – prohibited Garland from being extradited. Documents submitted by the United States to the court showed that in seeking to obtain and distribute the counterfeit notes, Garland had travelled to and from Ireland with those notes in his possession. The counterfeit notes are alleged to have originated in North Korea, which supplies the notes to diplomats who then sell them to others at a discount in exchange for legitimate US currency. Garland, with an address in Navan, Co Meath, had been a key figure in the Official IRA after it split with the Provisional IRA in the late 1960s. He had been arrested in 2005 on foot of an extradition warrant issued by US authorities, while attending the Workers’ Party Árdfheis in Belfast. He was released on bail and travelled to the Republic, where he was again arrested in 2009. Email “DPP to examine whether Garland should be prosecuted in Ireland”. Feedback on “DPP to examine whether Garland should be prosecuted in Ireland”.